Love you Puddles! Thanks for the illumination during times of darkness for we are all the sad clowns of America! I love this guy…surfing old talent show videos and discovered him. 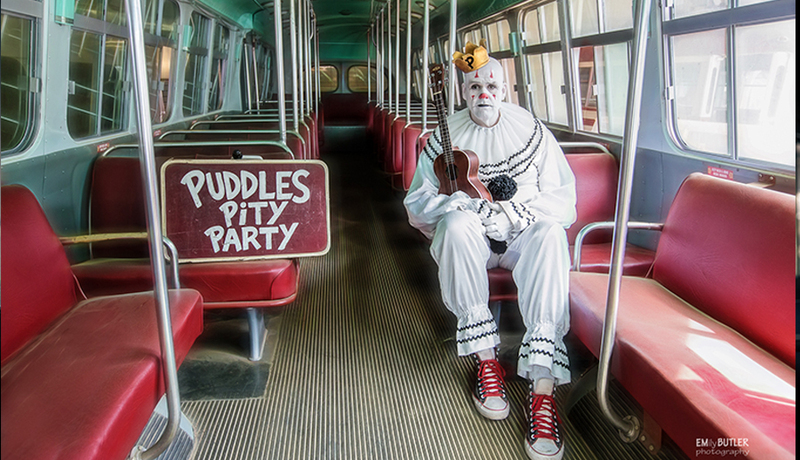 Puddles: I’m worried about you…you’ve lost weight, from the looks of your face. If it’s on purpose, well, then…okay. But if you’re working too hard….hmmm. And if someone is doing your make-up for you, they need to leave it just as it was….a little sadder and more tired/ironic, to contrast with, or enhance, your singing. We the world have just been waiting for you, and it’s a joy to see poor “Puddles” get filthy rich just being his unique self. Your voice and interpretation of so many different artists are amazing ,,, thank you and god bless.. perhaps one day , get to hear you in person… keep the music and emotion alive.